Thanks to a tip, I found this lovely book. It’s obvious this book is outdated. You youngsters might not know about “rabbit ears” (antenna) but if you are over 40, you probably had to help hold them in the right place so the picture wouldn’t be fuzzy. I think I spent the majority of the 1960s holding the rabbit ears while my dad fussed with tin foil. 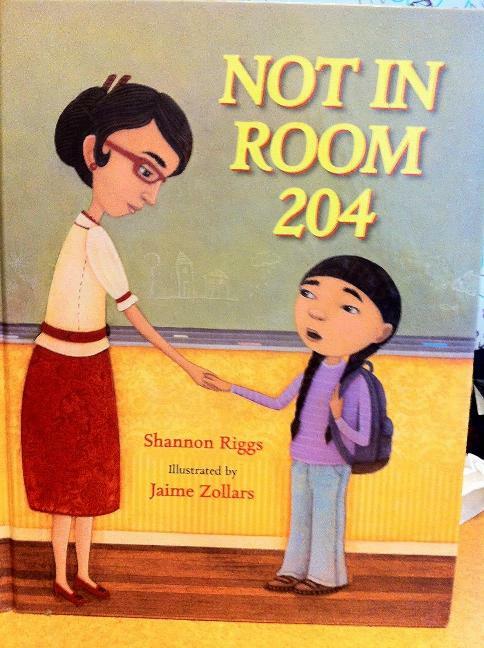 Anachronisms not withstanding, this book is odd because it looks like a picture book but the text is pretty dense. 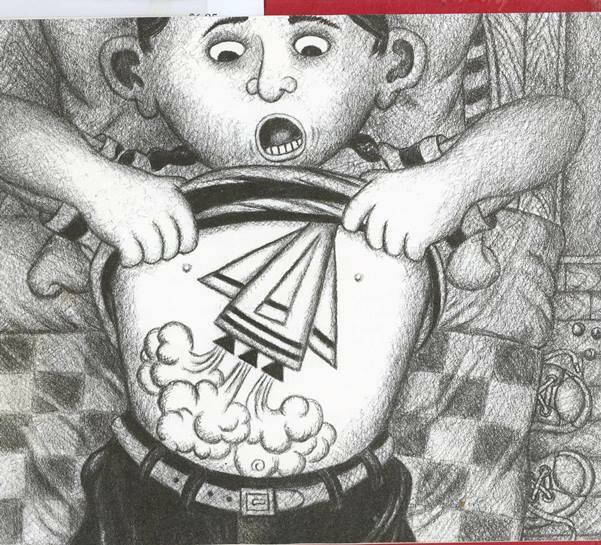 There are even “chapters.” The basic story is that this boy watches so much TV, he ends up having a television on his stomach. (They never do address the health issues associated with this phenomenon. Kind of disappointing.) I am not sure of the intended audience for this book. I am not sure I like the illustrations either. The people’s faces look weird and for the life of me I can’t figure out if the woman in the last picture is actually holding a box of ducks. She also needs a better bra. 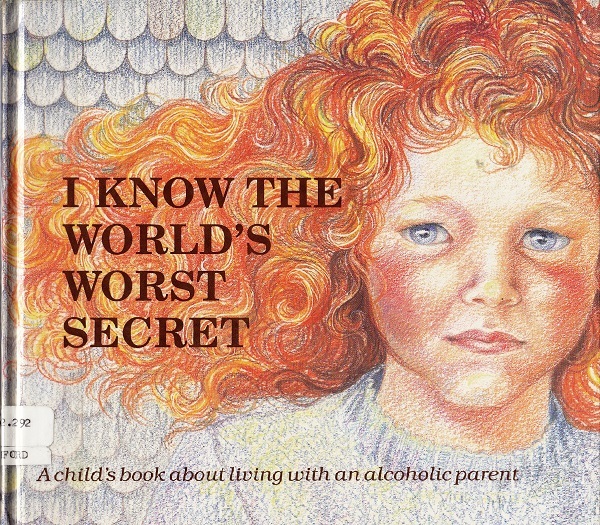 Any kiddie lit experts want to weigh in? I don’t get it. Stephen Manes, author of Be A Perfect Person In Three Days. Goofy, preadolescent humor. 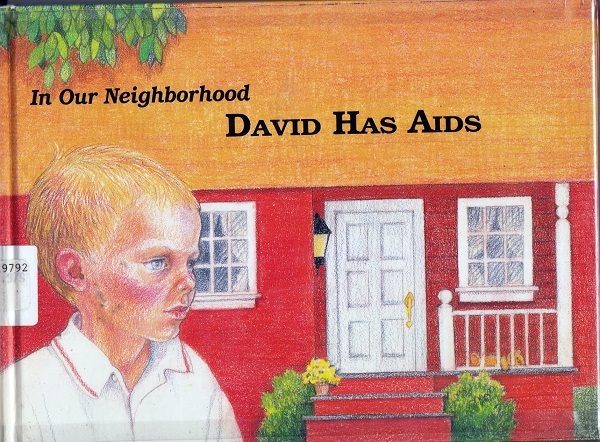 Yeah, the illustrations are definitely dated, but he is/was a good author. Michael Bass’s illustrations are, to say the least, off putting. I think the lady is holding a box of Peeps. She seems to be a fashionably free kind of late 70’s mom, judging by her clothes. I make NO comments on the teeth, teeth, teeth! My parents always told me that I watched so much television that my pupils were turning square… this book takes it up another level. It definitely had potential to be a story kids would enjoy, but the outdated (and slightly creepy) artwork and dense text won’t make it appealing to many or compel them to actually pick it up. I… think this is meant to be in the same vein as Charlie and the Chocolate Factory, as well as an attempt to encourage children to read? 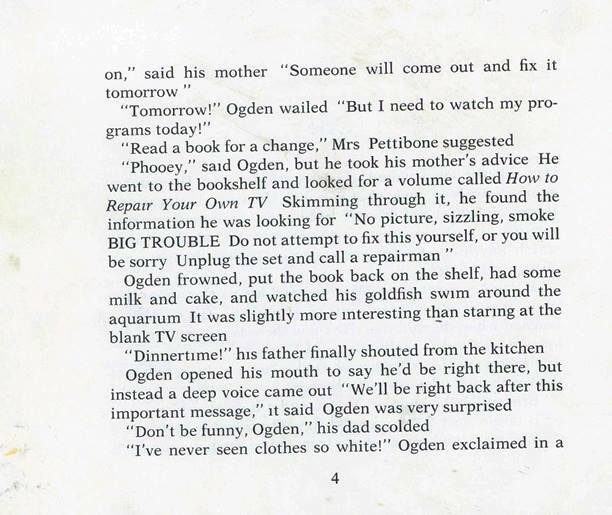 But the illustrations are mind-bendingly bad and terrifying, and the “happy ending” — that Ogden ends up being a walking, talking television on television — is more Kafkaesque than humorous. And yes, the lady with all the teeth appears to be holding a box of chickens — or Peeps? 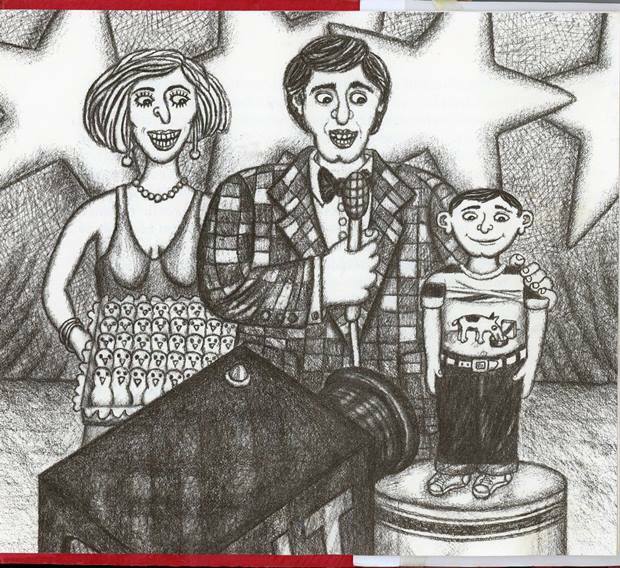 — and I am guessing that this is a talent show and her talent is being compared with Ogden’s and it is somehow concerned with chickens and teeth… going to keep the bedroom light on tonight, for sure. I think I prefer the book Bud the Spud by Adam Byrn Tritt about the dangers of sitting around watching too much tv. The choose-your-own ending has some rather appalling choices. 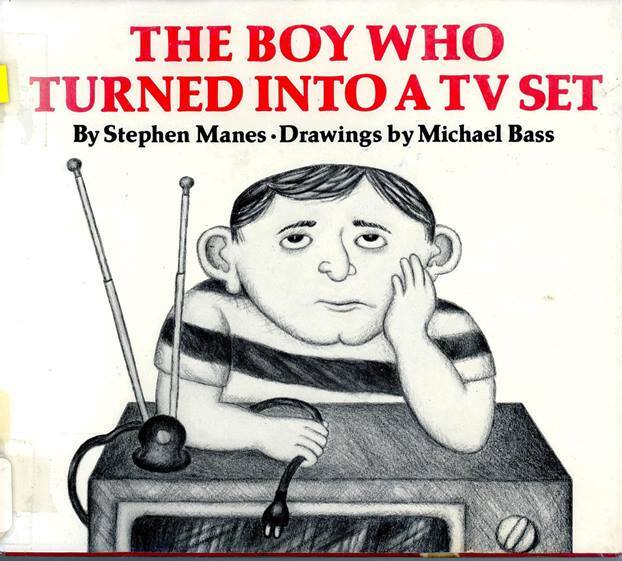 I’ve never seen this book, but I loved Stephen Manes as a kid! I still have a copy of “Chicken Trek” and it holds up. That’s certainly a unique concept. And note to all artists: when you draw teeth, please don’t heavily line every tooth all the way up to the gumline! It looks so disturbing. Clearly this book was meant for weirdos like me. 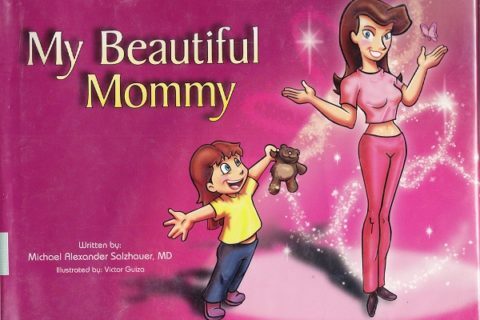 I LOVED this book as a kid. Stephen Manes here. Author as charged. And thank you, Mary Kelly, for this delightful honor. Even greater thanks to Karen, Gina, and Bob for the pleasantly nostalgic shout-outs. You want to know what really happened? Here goes–at least as much of the truth as my ever-dimming memory can manage to dredge up. This fine work, as Mary may have surmised, was originally meant to be a vertical-format chapter book. I even corrected final galleys in that format. All was well until the illustrator–not chosen or necessarily approved by yours truly–delivered the art either right on deadline or just afterward or a long while afterward. And that’s when I got a frantic phone call from the editor. Evidently this was the illustrator’s first book project, and he didn’t understand the standard for specifying book dimensions. Not being an illustrator, I don’t either, but supposedly it was either width first, height second or the other way around. Whichever, he got it backward and created the illustrations in the wide picture-book-style instead of the desired tall format. Because of the deadline pressure, the editor decided the quickest solution was to reset the type in a wide format to match the art. So what if the author had to spend extra time correcting a new set of galleys? So the book ended up in the format you see above. What happened when a paperback publisher came calling? Their format absolutely had to be the standard taller-than-wide. Solution: The whole thing, text and art, was letterboxed like some CinemaScope movie. You librarians can no doubt tell me whether that peculiar design is unique in the annals of publishing, but if not, I bet it’s close. Lirazel, please note that the tray of peep-alike candies in the illustration is an accurate rendering of the text. 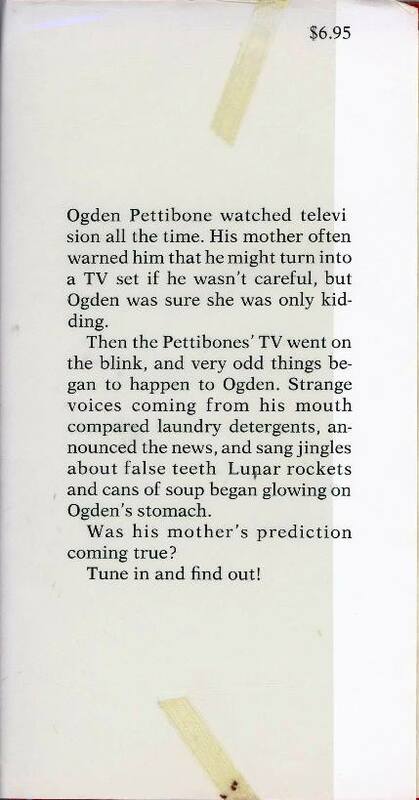 Ogden (The Boy Who) “appeared on the quiz show ‘Guess What I’ve Got,’ along with a woman who had grown a radish shaped exactly like a dinosaur and a man who owned the world’s largest chocolate-covered fish. Unlike the others, Ogden and his TV screen completely stumped the panel, and he won a lifetime supply of marshmallow chickens.” Mary, there was no description in the text of the presenter’s physical attributes or attire, so you’ll have to take them up with the illustrator.